Don’t worry if you have never sailed model yachts before – many of our members when they first joined were in a similar position. Learning how to basically sail them and control them takes around half to three quarters of an hour’s tuition although much practice is needed to sail them well of course. Nevertheless, plenty of help and guidance is available from experienced skippers who are always happy to assist you and let you have a go. In addition, the Club has one or two boats which newcomers can use to get the feel of the sport but these are not available for purchase nor may they be taken off Club premises. If you would like to try model yacht racing or just casual sailing why not come and see us and perhaps book a club boat for the day - it won’t cost you anything and could lead to an absorbing hobby where you will make lots of new friends. and cannot “feel” what it is doing – you only have sight of the boat and others around it and judging distances is all important (but comes with practice). 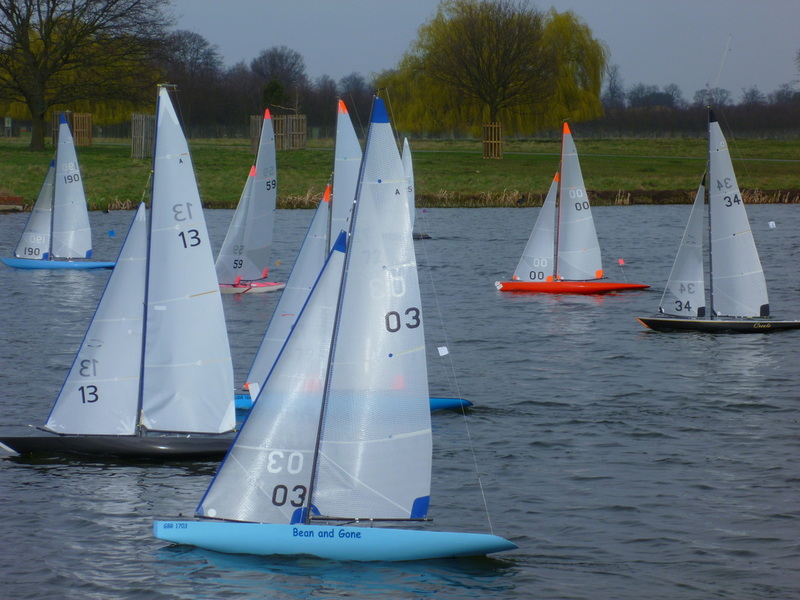 If you already own a model yacht you will, of course, be able to sail it at the Club at any time but, unless you already own or purchase a boat in one of the Club’s adopted classes (more about these later), you will not be able to join in any racing. Whatever you do, don’t be tempted to rush out and buy any model yacht from a high street model shop because it is almost certain that it will not be suitable or competitive for racing at the Club – talk to experienced skippers when you first visit us as they will be able to give you sound advice and let you sail a boat from one of our recognised classes so that you can gain some experience before you acquire a boat yourself. 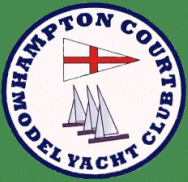 The Club’s adopted classes are the International One Metre - IOM, the Marblehead - M, the “A” Class - A, the 10 Rater - 10R and the DragonFlite 95 - DF95, all radio controlled boats. In addition the Club supports “free” sailing boats (mainly “A” Class ‘vane’ steered boats) and racing these types of boats occurs from time to time throughout the year. These boats have an overall length of 1 metre with a set of 3 sail rigs to cope with different strengths of wind. This class has developed into the most popular of the radio controlled classes since it was introduced in the 1980’s. These boats are light, responsive and very fast and can have a set of 5 sail rigs to cope with different wind strengths. Current hull designs are very narrow with stability coming largely from the deep fin. Simple swing rigs allow some designs to be rigged very easily. This is the largest sized boat that we sail and a fleet of RA’s is an impressive sight. They have between 2 and 4 sets of sails to cope with various wind conditions. They weigh between 14 – 25 kg and it is usual to move them about on dry land by means of a home-made wooden trolley. Similar in looks to the RM but longer with slightly more ballast and more powerful, these graceful boats are the fastest monohulls and the latest class of yacht to be adopted by the Club. It is worth noting that, with a R10R sail rig, RM’s can be sailed as R10Rs. The latest class of yacht to be adopted by the Club, the DF95 is an ideal boat for beginners in the sport. It is a one-design yacht and is easily, quickly and cheaply obtained and can be assembled and ready to sail with very little time and effort. Assuming you are beginner at the sport, we recommend that you choose a DF95 but if you decide on one of the other classes you should only purchase a good condition second-hand IOM, RM, RA or R10R. Boats for sale in these four classes are advertised on the Model Yachting Association website and, from time-to-time, on our own website. Before making a specific purchase, have a chat with our experienced skippers who will be able to tell you if the asking price is fair and whether the boat is of a reasonably competitive design. If you choose the cheaper option of a DF95 prices are such that purchasing a brand new boat direct from a supplier is a viable proposition. To begin sailing, you will need a transmitter, batteries, a suitable battery charger and possibly a set of radio crystals (often, second-hand boats are sold with this equipment as part of the deal). Finally, you will probably have a lot more questions in your mind – too many for us to cover here. The best way to answer these is for you to come and see us at the Club on a Wednesday, Saturday or Sunday morning when we will be happy to help and explain things in more detail.